1803 Candles has been around since 2006 – wow! To have such longevity in the candle industry means they must be doing something right. I was super excited when I was asked to review some of their candles. I knew I wouldn’t go wrong with whatever scent I was asked to review. 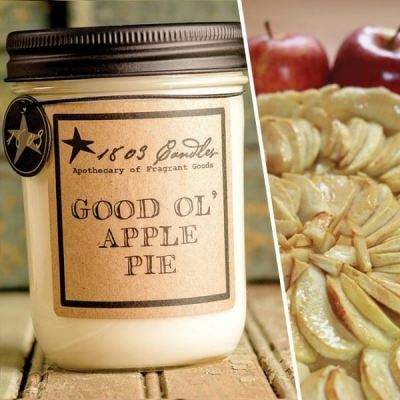 The first candle that drew my attention was a down-home bakery scent, Good Ol’ Apple Pie. I get a warm, fuzzy feeling every time I visit 1803 Candles. The unadulterated soy wax, the mason jars, the kraft type labels…all this calms me and gives me a sense of inner peace. According to the website, this is part of their “quest of capturing Simpler Times Renewed®.” I found that my Good Ol’ Apple Pie candle did capture that feeling. I had the larger 14-ounce candle to review, which was in a sturdy mason jar with a black, screw-top lid. The front label was simplicity at its finest – the company name and scent name were clearly displayed and no added fluff. The wax had the typical appearance of pure soy wax candles – no coloring or dyes necessary. There was a single wick that was thick and well-centered. What did my Good ol’ Apple Pie candle smell like? Bakery scents are my favorite, so I could not wait to open the lid and take a huge whiff. Mmmmm…delish! 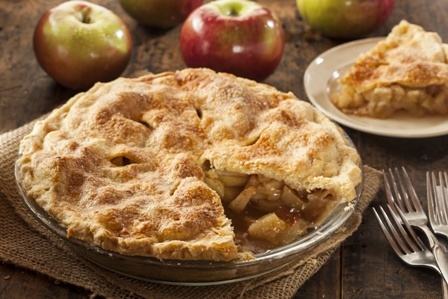 I’ve found many apple pie scents to be mostly apple and cinnamon. I don’t often get the pie crust notes I’m dying for in an apple pie candle. Not here! The first thing I noticed on cold sniff was a buttery, flakey pie crust smell, followed quickly by a good mix of apples and spices. The cold sniff won me over big time and I was anxious to get started with the burn! Ahhh…that was it! I found the description spot on for the cold scent and was ready to get down to business. I lit this candle in my guest bathroom (ok…strange place for a bakery scent…I know) and let this candle burn a while to work its magic. Oh…my…goodness! I’ll admit, it doesn’t take much for me to go hunting for a piece of pie, but this candle really made my mouth water! It was the buttery crust that did it. It smelled so good and authentic, it was simply divine. As the candle burned, I got more of the sugary spice blend (more spice than sugar) – definitely picking out the clove, cinnamon, and nutmeg. This had to be one of the most authentic apple pie scents I’ve come across in a long, long time. The 14-ounce candle had no problem filling my guest bathroom with its buttery goodness. I smelled it easily each and every time I walked into the room. I would describe the strength of this particular candle as moderately strong. It filled the air so that I knew it was burning, but it was not so overpowering that I wanted to snuff it out. Pure soy candles tend to be slow burners and I found this candle no exception to the rule. It took a couple of hours to get a full wax melt pool on first light. The candle burned evenly throughout the entire burn and there was no wasted wax on the sides. Love that! I had no black sooting with this candle. Just a clean, even burn that was enjoyable from start to finish. The wick was easy to maintain and the flame never got out of control. Good Ol’ Apple Pie from 1803 Candles was a truly enjoyable candle. An authentically scented candle that I enjoyed for hours on end. If bakery scents are your thing, I don’t think you could go wrong trying this one. As for me, I consider myself a completist when it comes to my passion for candles. Once I find a candle company I love, I have to try each and every scent they have to offer. Watch out 1803 Candles… here I come!